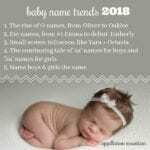 New girl names 2018 mix modern word names and international style. Respellings abound, as do inventions. And pop culture influence? The list packs in plenty of that, too. In May 2018, the US Social Security Administration released the new popularity data for all children born between January 1st and December 31st of 2017. 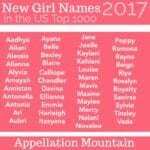 43 girls’ names ranked in the US Top 1000 that did not appear in the prior year. Wondering how that stacks up to previous years? 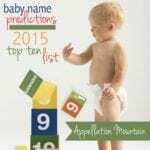 In 2017, 45 girls’ names ranked in the US Top 1000 that did not appear in the prior year. In May 2015, that number was 38. For 2014, it stood at 45. 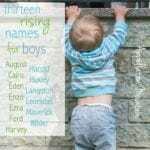 It took 258 recorded births for a name to make it on to the list, though the #1000 name – Alora – had just 257 births. Oh, those Kardashians! Brother Rob’s daughter with Blac Chyna, Dream, made it into the US Top 1000 this year. She was born in November 2016, and hasn’t left the spotlight since. That’s plenty of time for parents to fall in love with this sweet, simple, and meaningful name. Other word names debuting or returning to the list this year include Legacy, following favorites like Destiny and Serenity; gemstones Emerald and Opal; precious Treasure; and summery, casual Sunny. Sunny might also owe something to the youngest Baudelaire sibling in A Series of Unfortunate Events. The popular book series inspired a new Netflix adaptation, which debuted in January 2017. Speaking of television, two names come from Game of Thrones. First there’s warrior queen Yara Greyjoy, known for courage and intelligence. The name ties into other cultures and mythologies, plus it’s a butterfly name. The second is Lyanna, as in Princess Lyanna Stark. It’s an invention, but with the many forms of Lee Ann used in the US over the years, it’s not a stretch. And then there’s Octavia, the highest Top 1000 debut of the year. It’s the name of a main character on long-running sci-fi series The 100 on the CW. (The series helped push a boys’ name into the Top 1000, too!) But it’s also the name of Oscar-winning actor Octavia Spencer, known for a long series of critically-acclaimed roles on television and the big screen, too. Speaking of Spencer, it debuted in the girls’ Top 1000 this year. Credit might go to Octavia. It’s the maiden name of the late Princess Diana, born Lady Diana Spencer. (Though the timing seems a little off.) Spencer Grammer is actor Kelsey Grammer’s daughter, now an actor in her own right. And then there’s Spencer of Pretty Little Liars fame, which takes us back to the small screen. Maybe, in our age of Harper and Piper, Spencer was just a name waiting to happen. On the same note, there’s Marlowe, a modern favorite that finally cracked the Top 1000. We love to invent a name, one that mimics the most popular picks of our day. Lately that means dreaming up new surname-style names. Ensley claims some history as a surname derived from Anselm. But it shares sounds with modern favorites like Kensley, and owes its appearance on this list to – what else? – Teen Mom. Jenelle Evans welcomed daughter Ensley in January 2017, just in time to influence this year’s list. 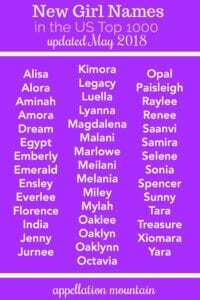 There’s also Emberly, a three-syllable, ends-in-y name that owes something to word name Ember and something to former favorite (and surname) Kimberly. With Everly in the Top 100, Emberly fits right in. Speaking of novel names, we do love to respell and mix and match to find new possibilities for our children. This year brought Paisleigh, a spin on Paisley, as well as Raylee, a Kaylee successor. Everlee joined several spellings of the name. There’s also respelled word name Jurnee. Speaking of invention, check out those Oak names: Oaklee, Oaklyn, and Oaklynn all debuted in the US Top 1000. They’re a little bit nature name, though not quite in the same mold as Magnolia or Wren. They owe something to the many -lee and -lynn names parents have embraced in recent decades. And they’re vaguely Western, too, a little bit Annie Oakley and slightly place name-inspired, too. Oakley appears in the current US Top 500 for girls and boys alike. When everything feels oh-so modern and maybe a bit extreme, it’s good to know that plenty of vintage choices have also staged a comeback this year. There’s sassy, retro Luella, elaborate and romantic Magdalena, and just Jenny, a name that seems surprisingly sweet and fresh. I’ve expected Florence to make a re-appearance, and sure enough, this was the year. With choices like Abigail starting to fade, Florence makes a logical substitute: capable, accomplished, and undeniably vintage. Of course, it’s also a place name, the storied city, known as the birthplace of the Renaissance. Given the city’s considerable history, many a fan of Florence might be thinking of Italy, too. Besides Florence, two more place names make this list. First there’s Egypt, a place name that follows Cairo into wider use. And then there’s India. It almost fits with Florence on the vintage revivals list. It’s said that the name was first given in honor of a family’s ties to colonial India. (That feels slightly challenging by 2018 standards.) The name must have filtered into general use – there’s a character in Gone With the Wind, singer India.Arie, and lifestyle entrepreneur India Hicks. Actor Chris Hemsworth named his daughter India in 2012. It succeeds on sound, with that stylish -ia ending, but also might appeal to globe-trotting parents. Speaking of India, it’s the source of another intriguing entry to our list: Saanvi. It’s associated with the goddess Lakshmi, the Hindu goddess of wealth. It’s been in the US Top 1000 in recent years, but not in the last few. Xiomara’s story is similar; it’s a Spanish feminine form of a Germanic masculine name. The X adds to the name’s appeal, but I’ve always heard it pronounced more like see-OH-mahr-ah. Samira returned to the rankings after a dozen years’ absence. It’s a name with Sanskrit and Arabic roots, and it’s powerfully pretty, too. Aminah is another Arabic name, joining the similar Amina in the Top 1000. Do Hawaiian names count as imports? Not exactly, I know. But Meilani seems to fit here, though it also claims pop culture ties. The name was boosted after Jersey Shore alum JWoww used it for her daughter in 2014. Lastly, there’s Malani. Is it a re-spelling of Melanie? A newly coined Hawaiian name in the key of Meilani? Maybe … But I found a Sri Lankan musician named Malani Bulathsinhala and an Ewok from the extended Star Wars universe. I’ll have to look for more about this one, but I suspect it fits best in this category. Speaking of Malani, a number of flowing, romantic names also debuted. There’s Alisa and Alora, plus Amora, the last almost certainly inspired the Latin amor – love. Mylah also fits in this category, picking up on popular names like Mila and Maya. And then there’s Melania. Gone are the days when we named our children after our political heroes in big numbers, but there are a few things about this First Lady name that feel different. First, it’s just not a name we’re used to hearing in the US; instead, it’s a European form of Melanie. It fits nicely with our preference for liquid girls’ names, especially longer choices. And while parents may eschew openly political names, you might argue that Melania is more celebrity than politician. Lastly, Melania replaced Milania, which left the rankings this year. The First Lady probably gets credit – at the very least – for making the Mel- spelling seem most familiar. I triple-checked to make sure Kimora really did appear on this list! Model-turned-designer and reality star Kimora Lee Simmons boosted her unusual name in the early part of the twenty-first century, but it had fallen out of use. Could it be our love of all those -ora names that gave Kimora a tiny boost back on to the list this year? Tara might fit in the same category. It left the list, only to return after a year’s absence. But it’s too soon to say whether that’s a trend or a fluke of the numbers. The same is true for the return of 1960s favorite Renee. Sleek Selene, on the other hand, seems like a promising up-and-comer. It’s a night sky girls’ name, like Luna and Stella. And the sound feels nicely on trend today. It’s also the name of Kate Beckinsdale’s character in the long-running Underworld series. The sixth and most recent movie came out in 2016; we’re not yet sure if there will be another, but it remains popular. And then there’s Sonia. It peaked in the 1970s, but doesn’t feel especially tied to that era. In fact, Sonia comes from mega-hit Sophia – it’s a nickname in Russian and other Slavic languages. Is this name on the verge of revival? Or is it more like Tara and Kimora, teetering on the edge of being gone for good? After several years’ absence, Miley returned. The name plummeted after Miley Cyrus shed her squeaky-clean image. Could it be that parents no longer associate the name solely with the singer? Or has our shock simply faded? That’s it for the new girl names 2018. Did I miss any? Which ones are your favorites? Alora is a beautiful name. It’s a great way to honor a Lora or Laura! Meilani is very pretty, too. My favourite would have to be Amora. I quite literally squealed in delight when I saw it ranked. As a Brazilian and hippie name lover it’s one of my favourite names from back home- Amora is Portuguese for blackberry. While there is no doubt in my mind Amora is charting because of its connection to love, it’s a beautifully spelt name that I’m happy to see any “version” of it used in any country!